 Rocket town: Huntsville, Ala. In the 1960s, Huntsville was often racked with earthquake-like rumblings as NASA's engineers tested boosters for rockets that would carry astronauts to the moon. In the past 50 years, this small city in northern Alabama has morphed from cotton capital to rocket town to high-technology hub. The U.S. Army's Aviation and Missile Command is housed in the nearby Redstone Arsenal, and the federal government employs more than 8% of the local workforce. But the city's thriving engineering community and tradition of innovation have also made it a breeding ground for tech entrepreneurs. 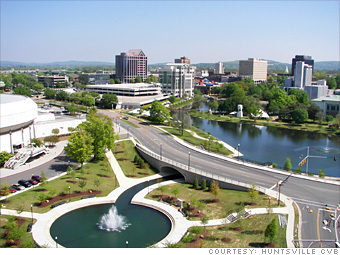 What do you think of Huntsville?